Every so often, here at Emerald Heritage, we get asked why we do what we do. Of course there are many reasons, including celebrating our own heritage and culture, but one of the driving factors is our hope to truly make a difference! Ireland has long been famed, as an Emerald isle full of lush green fields and dense, magical forests but the 21st century reality is a little different. From above, Ireland still appears to be the perfect patchwork quilt of varying shades of green but now, our homeland has the second smallest forest (proportionally) in Europe! Just 10% of the island is covered in forestry and the results can be damaging in their legacy. These worrying observations coupled with the fact that Ireland produced 2.1 million tonnes MORE greenhouse gases than projected between 2008-2012, means that now is the time to think green, buy green and help protect our beautiful country for future generations! What better way to help than to own your very own plot of Irish land that will forever stay green and natural as intended. Not only do we ensure that each Emerald Heritage plot of land stays completely green and untouched, we can also plant a native woodland tree just for you. You will be actively growing Irish forests, combating greenhouse gasses and keeping the Emerald isle green in all its glory. 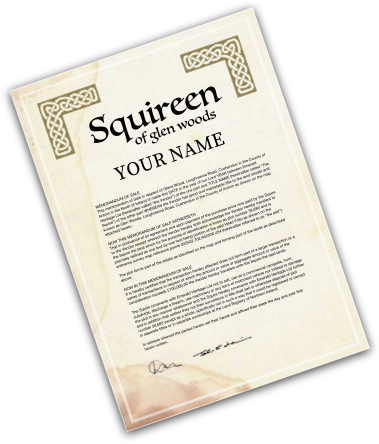 Add to that the fact that you’ll become an official Irish landowner, with the title Squire, Squireen or Squiress, and it looks like a win for everybody! If you’re thinking about giving back, give green!